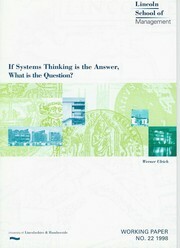 Are you sure you want to remove If Systems Thinking is the Answer, What is the Question? from your list? 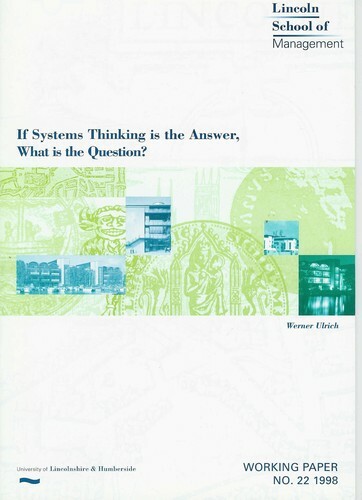 [Author's abstract] This Working Paper originates in a seminar with research students of the Lincoln School of Management on the topic of how we can develop competence in (systems) research. The seminar was held to guide participants towards reflection on their personal notion of competence, both in research and in professional practice. With the present paper, the author hopes to offer further help to readers who seek orientation in formulating or advancing their dissertation project, or who wish to clarify their notion of professional competence. The author is grateful to the seminar participants for many stimulating discussions, and to the Lincoln School of Management's Centre for Systems Research for offering him a Visiting Professorship that has proved to be such a stimulating and rewarding experience.